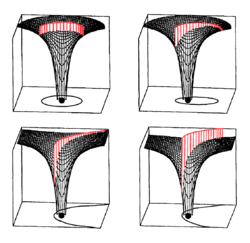 A hyperbolic trajectory is depicted in the bottom-right quadrant of this diagram, where the gravitational potential well of the central mass shows potential energy, and the kinetic energy of the hyperbolic trajectory is shown in red. The height of the kinetic energy decreases as the speed decreases and distance increases according to Kepler's laws. The part of the kinetic energy that remains above zero total energy is that associated with the hyperbolic excess velocity. In astrodynamics or celestial mechanics, a hyperbolic trajectory is the trajectory of any object around a central body with more than enough speed to escape the central object's gravitational pull. The name derives from the fact that according to Newtonian theory such an orbit has the shape of a hyperbola. In more technical terms this can be expressed by the condition that the orbital eccentricity is greater than one. Under simplistic assumptions a body traveling along this trajectory will coast towards infinity, settling to a final excess velocity relative to the central body. Similarly to parabolic trajectories, all hyperbolic trajectories are also escape trajectories. The specific energy of a hyperbolic trajectory orbit is positive. Planetary flybys, used for gravitational slingshots, can be described within the planet's sphere of influence using hyperbolic trajectories. 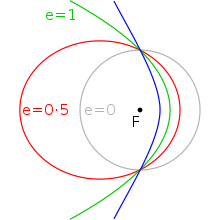 Like an elliptical orbit, a hyperbolic trajectory for a given system can be defined (ignoring orientation) by its semi major axis and the eccentricity. However, with a hyperbolic orbit other parameters may be more useful in understanding a body's motion. The following table lists the main parameters describing the path of body following a hyperbolic trajectory around another under standard assumptions and the formula connecting them.
) is not immediately visible with an hyperbolic trajectory but can be constructed as it is the distance from periapsis to the point where the two asymptotes cross. Usually, by convention, it is negative, to keep various equations consistent with elliptical orbits. Note that the total energy is positive in the case of a hyperbolic trajectory (whereas it is negative for an elliptical orbit). the asymptotes are more that 120° apart, and the periapsis distance is greater than the semi major axis. As eccentricity increases further the motion approaches a straight line. Hyperbolic trajectories followed by objects approaching central object (small dot) with same hyperbolic excess velocity (and semi-major axis (=1)) and from same direction but with different impact parameters and eccentricities. The yellow line indeed passes around the central dot, approaching it closely. The impact parameter is the distance by which a body, if it continued on an unperturbed path, would miss the central body at its closest approach. With bodies experiencing gravitational forces and following hyperbolic trajectories it is equal to the semi-minor axis of the hyperbola. So if a comet approaching Earth (effective radius ~6400 km) with a velocity of 12.5 km/s (the approximate minimum approach speed of a body coming from the outer Solar System) is to avoid a collision with Earth, the impact parameter will need to be at least 8600 km, or 34% more than the Earth's radius. A body approaching Jupiter (radius 70000 km) from the outer Solar System with a speed of 5.5 km/h, will need the impact parameter to be at least 770,000 km or 11 times Jupiter radius to avoid collision. If the mass of the central body is not known, its standard gravitational parameter, and hence its mass, can be determined by the deflection of the smaller body together with the impact parameter and approach speed. Because typically all these variables can be determined accurately, a spacecraft flyby will provide a good estimate of a body's mass. is the angle the smaller body is deflected from a straight line in its course. where μ is a gravitational parameter and a is the semi-major axis of the orbit. The flight path angle (φ) is the angle between the direction of velocity and the perpendicular to the radial direction, so it is zero at periapsis and tends to 90 degrees at infinity. is the (negative) semi-major axis. Note that this means that a relatively small extra delta-v above that needed to accelerate to the escape speed results in a relatively large speed at infinity. For example, at a place where escape speed is 11.2 km/s, the addition of 0.4 km/s yields a hyperbolic excess speed of 3.02 km/s. This is an example of the Oberth effect. The converse is also true - a body does not need to be slowed by much compared to its hyperbolic excess speed (e.g. by atmospheric drag near periapsis) for velocity to fall below escape velocity and so for the body to be captured. A radial hyperbolic trajectory is a non-periodic trajectory on a straight line where the relative speed of the two objects always exceeds the escape velocity. There are two cases: the bodies move away from each other or towards each other. This is a hyperbolic orbit with semi-minor axis = 0 and eccentricity = 1. Although the eccentricity is 1 this is not a parabolic orbit. In context of the two-body problem in general relativity, trajectories of objects with enough energy to escape the gravitational pull of the other, no longer are shaped like an hyperbola. Nonetheless, the term "hyperbolic trajectory" is still used to describe orbits of this type. Vallado, David A. (2007). Fundamentals of Astrodynamics and Applications, Third Edition. Hawthorne, CA. : Hawthorne Press. ISBN 978-1-881883-14-2.